1989 oddballs BEGGARS & THIEVES rose to fame as they were signed to Atlantic records after only a demo (albeit produced by Desmond Child) and five gigs. Their debut was released in December 1990 and both chartered, and was critically acclaimed. They were never a hair band, but more of a classic rock band. But in the death of hair bands, BEGGARS & THIEVES was swept along after a second album called “Look What You Create”. Main men vocalist Louie Merino and guitarist Ronnie Mancuso soldiered on in the music business as jingle makers and making music top order for the likes of NASCAR. IN 2004 they got back in the saddle, this time together with Brent Muscat (ex FASTER PUSSYCAT) under the moniker Sin City All-Stars, opening for bands like SLAUGHTER, TESLA and RATT. 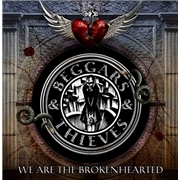 But the return as BEGGARS & THIEVES cames as the pair started recording what was to become this album together with JOAN JETT and THE BLACKHEARTS drummer and bass player, Thommy Price and Enzo Penizzotto. Today the band consists of Louie and Ronnie, plus experienced drummer Erik Gloege and 22-year old bass man Blake Newman.